I found myself unable to sleep the other night because I was so worried about this year’s severe flu, and if I, a person living with HIV (PLHIV), am more susceptible to acquiring it. The stress of outbreaks is already heightened given the recently increased rates of Hep A. My paranoia isn’t unfounded; after all, HIV is a virus that weakens the immune system. And most of us Positive folks have received a stern warning from a doctor or nurse regarding the vulnerabilities of our weakened immune systems. In response to my concern, I looked into why this year’s flu is so bad and if PLHIV are more susceptible to flu in any given year. Thankfully, the Washington Post read my mind and reported today on this flu season and why it is the most widespread (see map below) on record. The Post’s article explains that more than 8,900 people have been hospitalized since Oct. 1, the beginning of the flu season, and has lead to a higher than normal number of deaths of children. The Center for Disease Control and Prevention (CDC) further explains that part of the problem this year is that this strain, H3N2, is one of the “nastiest” to confront our modern population. It is good at working around our immune systems’ defenses and current vaccinations are less effective at blocking it. They also state that the season was predicted to peak the first week of January, but rates have continued to rise. So we, as a general population, are up against a powerful influenza virus without knowing when it will end. But us PLHIV know that not all of our HIV experiences are the same. If you are one who has an immune system already damaged by HIV, then your doctor may suggest flu-fighting medications sooner than they would to someone who was able to fight against their HIV earlier on. With that said, it remains important to take steps to protect yourself against this year’s flu, just as your HIV-negative friends and family ought to do. 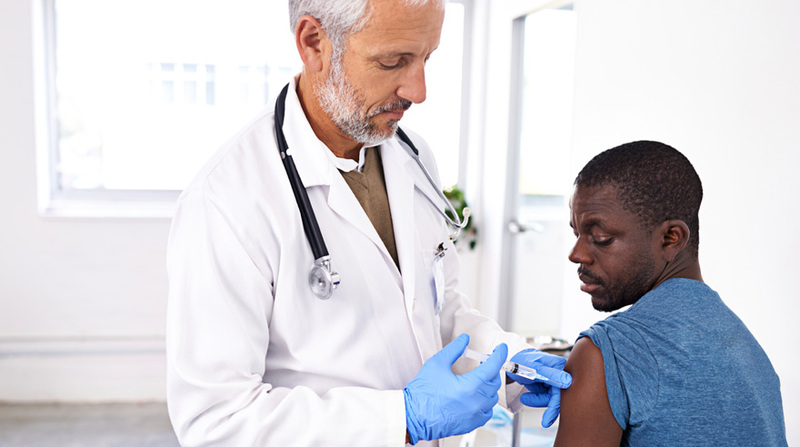 The CDC continues to recommend a flu shot even though it has been less effective this year. They recommend it is because states where H3N2 has been prominent have also seen high rates of more common strains against which the current flu shot is more effective. They caution that there is still a long time to go in this flu season and, like stated above, it is very difficult to predict when it will end. Beside the flu shot, there are many ways to protect yourself and we hear them every year: wash your hands with soap for at least 20 seconds; cover your mouth and nose when sneezing and dispose of tissues right away; avoid touching your nose, eyes, and mouth; and avoid contact with sick people. I’ve also seen it suggested that you keep your toothbrush away from others’, clean surfaces with anti-bacterial products, and frequently launder your bedding. A note on adherence: It can be difficult to maintain your HIV-medication regimen when you are sick with the flu or otherwise. Heck, it can be hard to remain adherent even when you feel great. Remember: it’s just as important to take your antiretroviral therapy when you are sick as when you are not. No matter how much I teach and preach about HIV and taking control of it instead of letting it control you, I still have my own ongoing struggles. One of them is with adherence. It’s not because I question the medications or their importance. It’s because I have a tendency to let life get away from me. This shows up in a deeper depression, heavier drinking, lower funds, and less fresh, stable eating. I pamper myself with gifts, food, and décor. I also live across the state from my family and getting back to visit during the holidays can take a large bite of my wallet. Sometimes, it gets really real like this week when I cancelled an infectious disease appointment because I wasn’t sure if I would have enough for the copay. I recently rented a car as an indulgence to visit family for Thanksgiving, but unfortunately I had to do the same the following week for a funeral in the same city across state. While giving me better options as far as schedule, this unexpectedly set back my wallet, and on top of that, I need to reschedule my appointment. I’m not upset about not having money; I am upset about losing control over my treatment. I am undetectable, but I cannot continue proclaim so if I do not have the labs to prove it. My last labs are from July of 2017. Now I am at the mercy of Henry Ford’s appointment openings and running the risk of getting off my ID-appt-every-six months schedule. At least I have medication refills to last another couple months. I think. But I do not wish to make that yet another thing to have to handle and remember. Once those things start adding up, I tend to fail on all accounts. It’s happened before. For more HIV and the holidays reads, check out Being Positive and Beating the Holiday Blues or this reminder from 1992 of how far we’ve come: Holidays and the Bad Tidings of H.I.V. So, how could I have handled this better? For one, I could have looked before this past weekend to see when my appt was scheduled to take place. This would have reminded me to set aside the copay. Instead, I squandered it on a rental car (and Starbucks, to be honest) when I very well could have saved with Greyhound (and… Speedway?). Perhaps that would have worked, but perhaps another angle to consider is the mental health benefit I had by renting a car. I used Turo, a site that connects you to vehicles listed by their owners. I had a 2016 Chrysler 200c. It was a sweet ride, and since I rely on bus and Uber here in Detroit, it felt awesome to speed down the freeway with music blasting. It was an expensive feeling, but I did a lot of thinking along the way and had numerous moments of clarity re: life. Either way, I packed my travel pill case with a few Genvoya even though I knew I’d only need one. I managed to maintain my eating times so that I could take my medication at 7pm without suffering an upset stomach. When I was home, I answered my family’s questions like, “How are you doing with… everything?” Y’know, everything being the menacing little virus that’s suppressed into some dark corner of my body (apparently the stomach and lymph node areas). Those moments make me yearn for the days when I could handle and sustain a stronger buzz. Now I have to face reality as it happens. But it’s all in the name of remaining adherent. Undetectable. Untransmittable. Since my tolerance is diminished, I am also working to lessen the amount of alcohol I consume. I find this is connected to my medication–this has affected my adherence in the past. I take my medication between 7pm and 9pm. This is so I will have eaten dinner because my meds hurt my stomach if it is empty. However, if I drink around the same time as, or even hours after, taking my meds, I will certainly feel queasy and uneasy. Many times I wake up the next morning feeling like back in the day when I could have more than a bottle of wine and be okay the next day. But again, it’s reality-facing time and all that. While we get to celebrate the holidays and hopefully have some time off with friends and family, we positive folks know the virus is always there waiting for an opportunity. As I move into Part 2 of the holidays, I seek to do a better job preparing for financial hiccups, upset stomachs, and several days of being away from my home without a maintained buzz. But hey! There are many more ways to make it through and even enjoy the time.